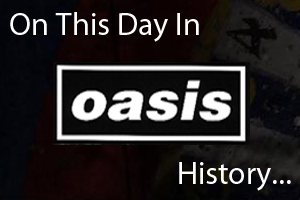 On April 10th 1996 Oasis played at the Pacific Coliseum in Vancouver, Canada. The band left the stage after six songs after fans threw coins and shoes at them. Listen/watch some footage from the gig below. On April 10th 2000, Oasis appeared on 'The Tonight Show With Jay Leno' and performed 'Where Did It All Go Wrong' from 'Standing On The Shoulders Of Giants'. The show was recorded in Los Angeles, click here to watch the video. On April 10th 2009 Oasis played at the Coca Cola Fest at the Newmarket Racecourse in Johannesburg, South Africa. It was their first-ever gig in the country.